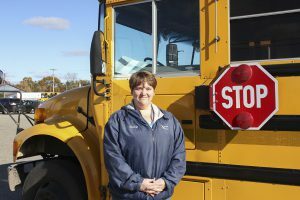 Waterford bus driver Becky Lesh tears up discussing her love for her job, and she shares how the MEA transportation unit she leads beat privatization—for now. Isn’t safety becoming even more important in your job? It is. There’s so many distracted drivers, and so many laws have changed for us as drivers. We now have hazard light stops. We had a four-point system, and now we have an eight-light system. And each of our drivers have a crossing guard hand signal, so the students know, whether they’re preschool or seniors, or even life tracks (which is my special needs kids up to age 26), if the hand is closed, they do not cross. When we put our four fingers up, they can cross. Why should districts think twice about privatizing? Our drivers live and work in the community, have children here; they’re invested. They have a commitment. See, now I’m going to cry. We look out for each other’s children, and every child on these buses becomes your child. This is my 14th year, so my original group of kindergarteners are now in their second year of college. When you bring in the outsourced company, they have a lot of turnover. They bring in staff that may live in Lansing or Flint to work for a day or a week if they’re short. That individual doesn’t know these children. They don’t know the area. In 2015, our district went out for bids and found we were $500,000 cheaper, so they didn’t privatize us. They privatized our custodial and maintenance group through attrition. This year the bids came back that we were $700,000 to $1 million cheaper than the private companies, but the superintendent wanted the board to spend that money. They said, ‘It’s not about money.’ We’re a district that’s been taking money from our employees to stay afloat, and it’s not about money? How do you fix a shortage? They raised the rate of pay. We were being paid $14 to $16.80 an hour, and they raised it to $17. But another thing I pushed hard on was right-sizing the department. In the last ten years, we lost over 10,000 students. How are we running within 10% of the same number of buses? We used to have 23 elementaries in our heyday, and we’re down to nine now, so there should be less buses. All of our runs are full, and things are working better. But we’re still afraid they’ll privatize us at the end of the semester. I’ve been assured by school board members that are supportive that they won’t let that happen before next summer. So we’re trying to keep the community involved. What’s your advice to drivers in districts that are looking to privatize? With our school board, I said, “Get involved. Come ride the bus with us. Come talk to us.” And we had one board member who did. He took back to the rest of them that it was an eye-opener, that you don’t realize what goes into a day’s activity. It’s not just starting the bus, going out, picking them up, and dropping them off. There’s a lot in timing, and there’s a lot in how much the drivers know about these children, and how much the children mean to us. Where do I update contact information? You can contact the MEA Help Center at 1-866-MEA-HELP or through the live chat link at the bottom of our website.